On interviews, every blogger or author would be invariably asked about their writing process. We all maintain a modus operandi while indulging in a task and the statement stands true not solely for writing. If I am to write in detail about my writing process, I would have to rummage through the cluttered nooks and corners of my mind, for I would like to begin the story from the point where it all started. As I have mentioned in a few posts before, I started writing during my college days. The first article, or for that matter, the first piece, ill-formed or not, that I ever wrote was a short essay on my relationship with my brother – the fun we had as children, the pillow fights, the exhilarating time we spent in the company of each other during long summer vacations, the moments of hyper excitement during cricket matches, and many more. I believe art is inspired from life, although there are heated debates going on regarding the matter, with some rooting for the contrary. During those days, my life revolved around my parents, my brother and a handful of friends I had in school. I was peculiarly shy back then, which limited my relationship with my teachers, while I saw many exuberant friends of mine bonding with our teachers like they were friends. For the reasons mentioned above, my thoughts and worries mostly surrounded these special people in my life. The article had my affection for my brother smeared in it from head to tail and I remember being particularly happy about the same after having written it. I did show it to my brother that day, but sadly, I cannot recollect his reaction now. It was at least five years later that I started writing seriously. Inspired by a few well written blogs, I decided to create a blog for myself and thus was born my blog at blogger, titled ‘Chasing Passions’. I have been writing passionately since then, albeit taking long blogging breaks in between, when the calls of my profession intrude my otherwise structured blogging schedule. Still, I cannot complain knowing the way my writing journey has been moving so far. When it comes to writing, I maintain a few ground rules. In the beginning, I used to scribble on a piece of paper the whole blog post, before copying it onto the screen. The habit wore out gradually as I found it terribly time consuming. I now type directly onto my laptop, which is a Lenovo, something which I consider my priced possession; something on which my first manuscript was born. If I want my blog post to be a list, then I make sure that I jot down the points before I list them. Otherwise, I stick to my keypad. Another habit that I am particular about is that I need to be strictly in a silent place while I write. True to Stephen King’s words, I prefer writing with my doors closed. The habit blossomed early on in my writing career itself. Even for editing, I prefer being alone. And being alone, translates to being absolutely alone. I sit on my chair, leaning onto my desk, with the drapes of my curtain tightly shut so that no streak of light enters my eyes, other than the artificial lighting I have in my room. Whether it is psychological or not, I cannot substantiate, but then aren’t all quirks so? Writing down on a note book. Writing few words at a time. By shifting my location from desk to bed or even to another room. By reading other blogs or well-written books for inspiration. By taking sips of water or a hot or cold beverage in between. By taking a break from writing and focussing on a mode of leisure, before resuming writing. As I write this, I am amused to suddenly re discover the many quirks I have with regard to writing, which have melted into my writing process and have become inconspicuous to my eyes over the time. Talking about my inspirations, I should confess that I am rejuvenated by a song interlaced with evocative lyrics, as much as a book written in an elegant prose. I am inspired by author interviews and there was a time when I used to read articles on writing back to back for that much needed nudge to write. Sometimes, even the sight of a book I admire, prompts me to write. Most of the times, there would be nothing jutting out from my head that needs urgent attention by my writing gene, nevertheless, I sit down to write, open my laptop, stare at the blank screen awaiting ideas and thoughts to come barge in and barge in do they, much to my surprise. Today, as I returned from the hospital, I had a niggling worm inside me that screamed to me to settle down after a shower to write. I started this blog post with no plans in my mind, but here I am with yet another blog post, which in turn strengthens the belief in my decision to abandon laziness and self-doubts and to simply write, if I am to satisfy my passion. So, do you have any such quirks when it comes to writing? Do share. Loved reading about your writings process. Like you, I need my peace but that’s okay if I hear traffic around. I need a comfortable place and a mood when thoughts can keep flowing. I also prefer to jot down points before beginning to write. You have a way with words. That was well written. It’s always interesting learning about how different writers approach their craft. I’m similar to you in that I prefer to write and edit in the quiet, but with four cats tearing around my office and looking for attention it can be rather challenging! Thanks for sharing your reflections. Oh, tell me about cats. I have a few cats in and around my house too. But I have to say I like their company. I am away from home now and I miss them like anything! Loved knowing about your thought process, your writing quirks and how systematic you are in your approach towards writing. I can write even in the noise and midst distractions ( though I write better at peace) an adaptation I have developed due to my life’s trying circumstances. I am with you on jotting down points beforehand, but the rest, I just go with the flow. Like you, I write in silence. I close my room’s door. I think I need isolation. It’s a process. Also, I have to feel what I write. Else, it’s an article, not a heartfelt piece. From last 1.5 years, I write daily. Be it a small passage of 50 words. Congratulations on your book and hope your schedule now permits you to blog often. Thank you so much for the wishes, Saru. I hope I could be more regular in blogging. It is going to be a bit hectic over the next few months with my higher studies restricting my writing, but I am trying my best to tend to my blog. I need silence, too. And, I also need the night…the silence and darkness invite my muse. I love solitude – when writing, when reading. I write in my notebook first – even if it’s a dirty first draft – but I must have my content when typing or else I would be staring at the screen. Even better, I’d just waste my time on internet surfing. I can’t write peacefully if I don’t like the font. When typing, I prefer Garamond. When writing on paper, I get restless if my handwriting doesn’t flow well. I dislike gel pens. I often use pencil for better handwriting. You are an honest writer, Maliny. I can read your dedication and sincerity in these words. I want a quiet space too but with two kids, it is impossible and while putting them to sleep, my mind plays unwanted tricks with me giving me ideas which, the moment my kids have slept, vanish – probably they are transported to the dream world of my kids – a place I cannot enter…..Do you have that write-up on your brother ? I would like to read it, if possible….It reminded me of my own childhood and made me yearn for my only brother’s presence who is now no more…. This is an honest account of your writing Maliny, I loved it exactly for that. it is cent ppercent true that if you were to wait for the feeling of writing to comeby, you never end up writing. Although writing has become a part of me, I sometimes do not prioritise and hence lag in some of the major places where I need to be seriously heading in leaps. You have inspired me to write today – the ones I have been putting off. Reading you after a really long time and I am glad I did. I missed all of it last few months. 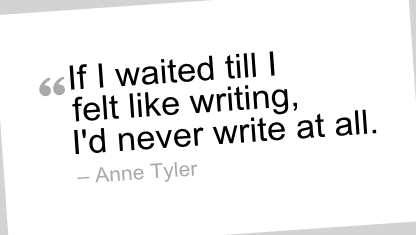 It happens to me as well when I probably want to change the place of my writing, or maybe the flow or the table or the style. One pattern cannot continue with me… Ever!